We tend toward hibernation in the winter — this is Wisconsin, after all. But now that it’s spring we’re feeling mighty sociable. It’s time to have some options on hand for unexpected guests. 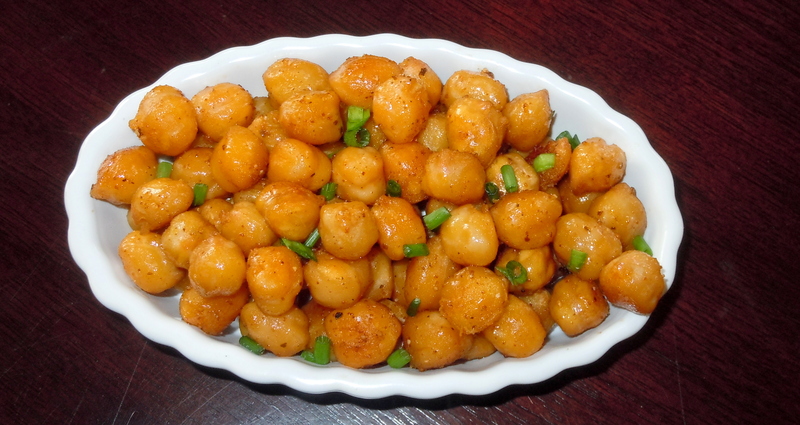 For example, my pantry has cans of chickpeas, because roasted chickpeas are The Bomb, and can be made in 15 minutes. Kale in the crisper means salty, shatteringly crisp kale chips in no time. 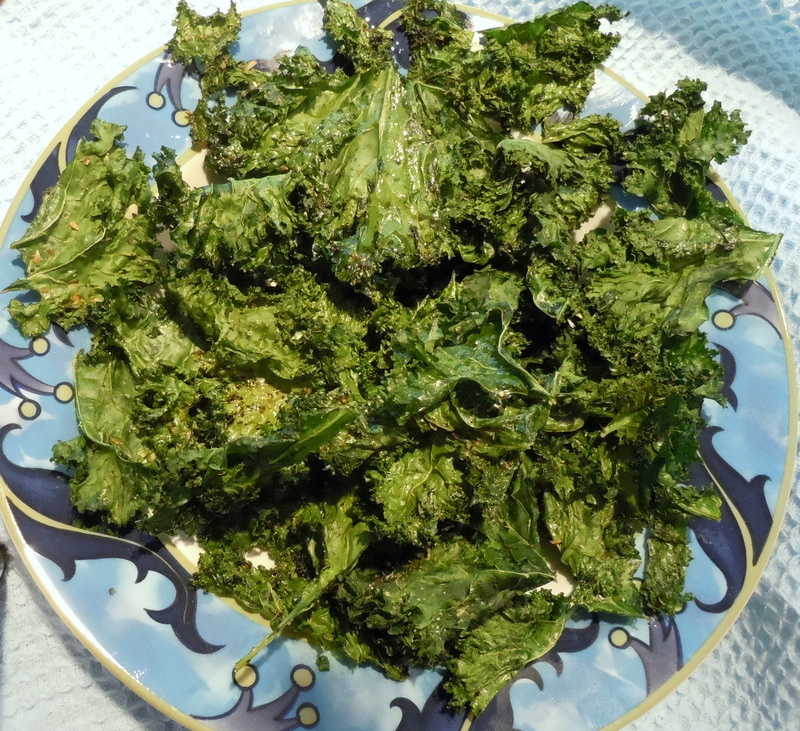 Kale chips don’t even need a recipe; just wash and DRY the kale (very important), toss with a little olive oil, spread out in a single layer on a cookie sheet, sprinkle with salt (and whatever other seasonings you fancy), and roast in a 350°F oven until the kale is completely crisp, about 15 minutes. To balance all those healthy treats, it’s time for a little decadence: parmesan-nut shortbreads. The dough takes minutes to put together, and can hang out in the fridge for a week or in the freezer (well wrapped) for a month or two. Since the dough is in the form of a skinny log, it can be sliced and baked mere minutes after coming out of the freezer. The shortbreads can be made several days in advance, if you hide them really well. They’re way too good to survive out in the open. These delectable morsels are basically savory refrigerator cookies. If you’re a patient Martha Stewart type, you can manipulate the dough into a perfect cylinder. Personally, I use up all my patience with my family and dogs (where it’s put to much better use), so my logs are lumpy and misshapen, and the resulting cookies are somewhat freeform. They’re buttery, rich, slightly salty from the cheese, and crunchy from the nuts. The shortbread is sturdy enough to hold a topping; a dab of orange marmalade or chutney provides a sweet-tangy contrast to the rich, salty cookies. A smear of herbed cream cheese or soft chevre topped with a sliver of cherry tomato would be really pretty. Frankly, the shortbreads are so fantastically satisfying all by their little selves that we usually eat them plain. You want to use a good hard cheese here. Asiago, Romano, or even a dry, crumbly sharp Vermont cheddar are great subsitutes for the parm. 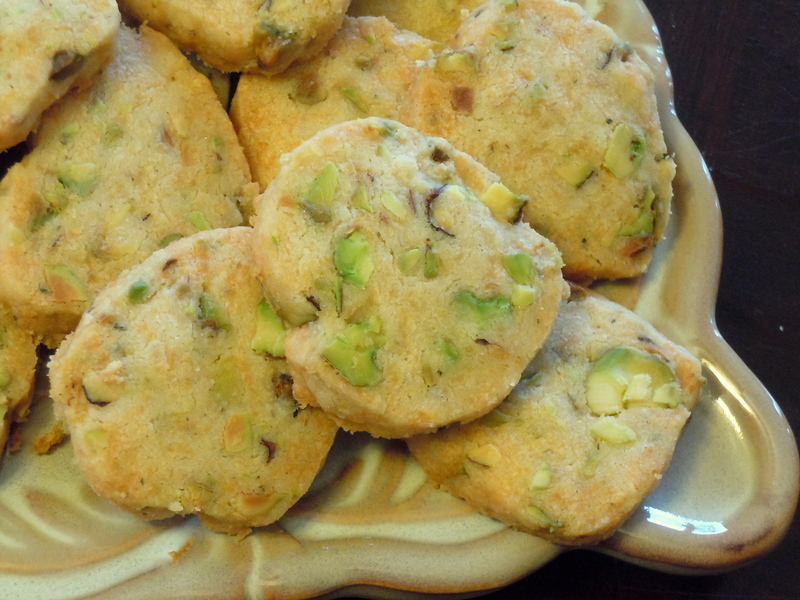 Walnuts, pistachios, and almonds all work well; pecans make a slightly sweeter shortbread. To save time, use a food processor or mini chopper to chop the nuts; to make it even faster, leave the nuts out altogether, if you want. I like the herbal complexity of thyme. Use whatever herbs you prefer, or skip them. This recipe doubles easily, by the way. Line a cookie sheet with parchment paper. In a small bowl, stir together the flour, cayenne (if you’re using it), thyme, and salt. In a mixing bowl, beat the butter until it’s creamy. Beat in the parmesan, then the dry ingredients. The mixture will be crumbly. Stir in the nuts. Squeeze the dough with your hands until it comes together. Put a square of parchment paper or waxed paper (roughly 15 inches) on the counter. Pile the dough in a long strip about 3 inches from one side. 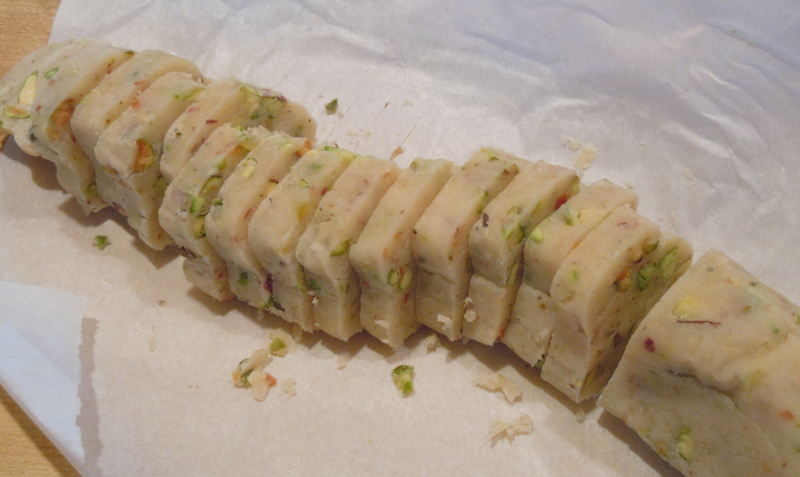 Roll the short end of the paper over the dough, and pull on the paper to create a tightly covered, smooth log. Roll the log in the rest of the paper, and twist the ends. Refrigerate the log for at least an hour, or up to several days (or wrap again in plastic wrap and freeze for up to 2 months). Heat the oven to 400°F. Using a sharp serrated knife, cut the cold log into ¼-inch-thick slices. It helps to drag the knife through the dough using slight pressure, rather than pressing firmly straight down; that results in a flattened log. Lay the slices flat about an inch apart on the cookie sheet and bake for 10 to 12 minutes, until the cookies are light gold. Cool on a rack and store in an airtight container at room temperature. Makes 28-30 shortbreads. 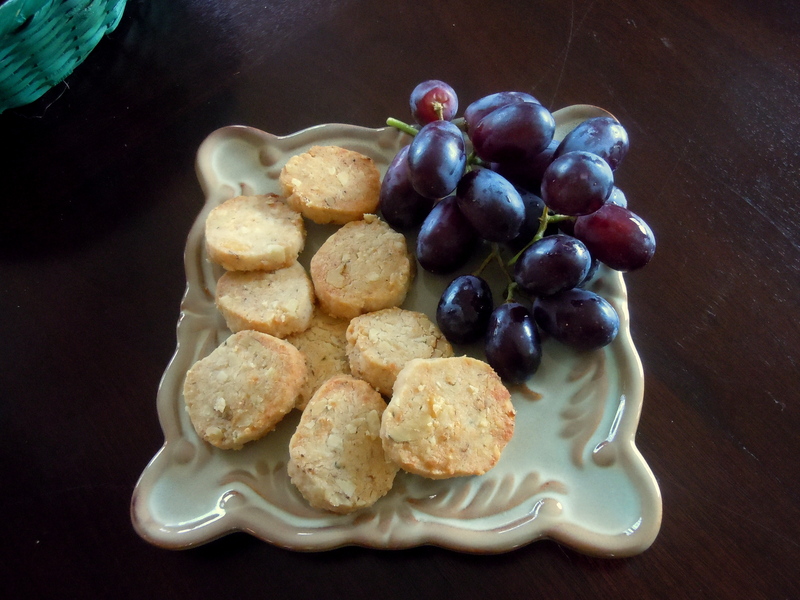 This entry was posted in appetizers, baked goods and tagged cracker, parmesan, savory, shortbread. Bookmark the permalink.